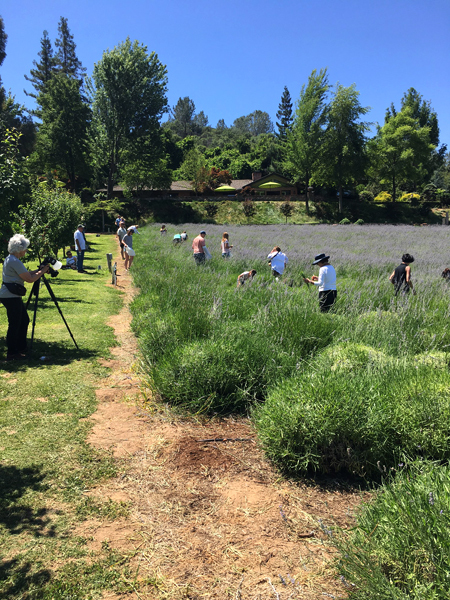 I was invited by my girlfriend Carolyn for a day of lavender picking on Sunday, June 4. She sent me and our friend Kelly a link to the High-Hand nursery website pop-up event and I was intrigued and immediately started reading. 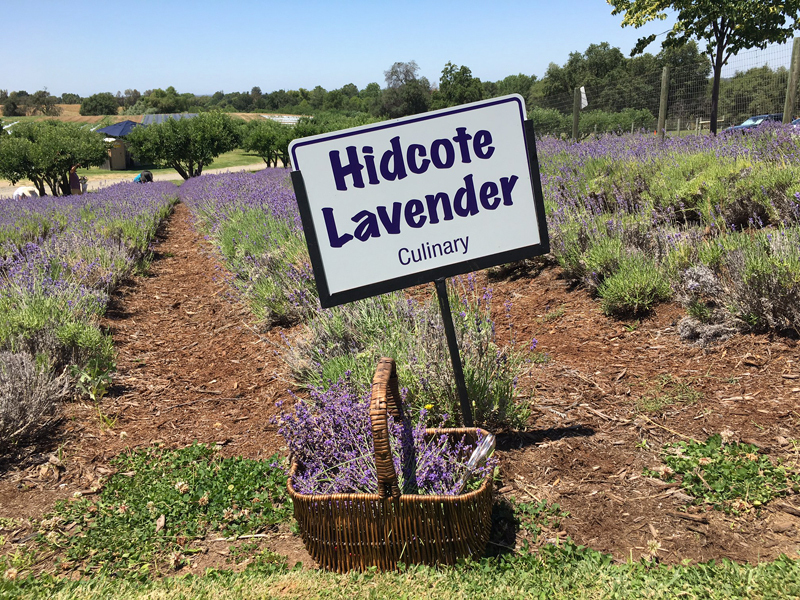 Come picnic, explore the gardens and harvest lavender bouquets… sounded like fun to me. 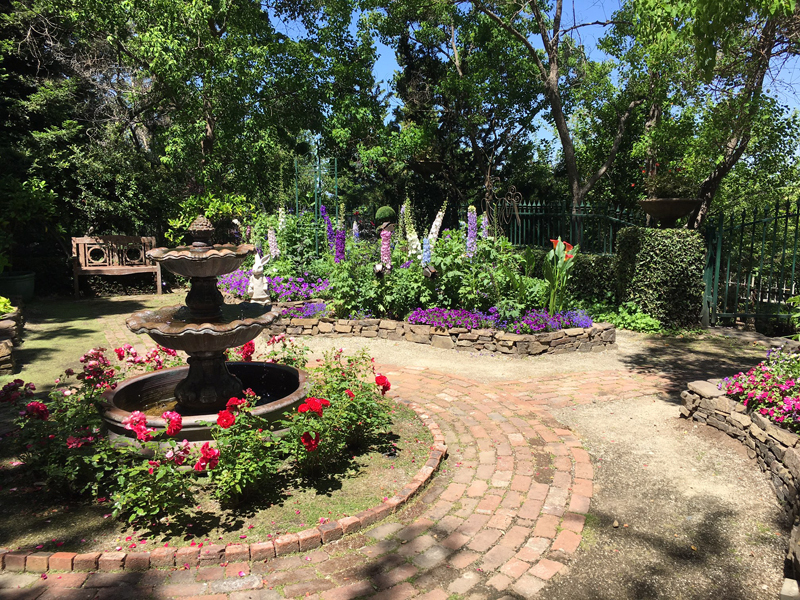 I’d previously visited Maple Rock Gardens for several antique shows and I knew the grounds were gorgeous. 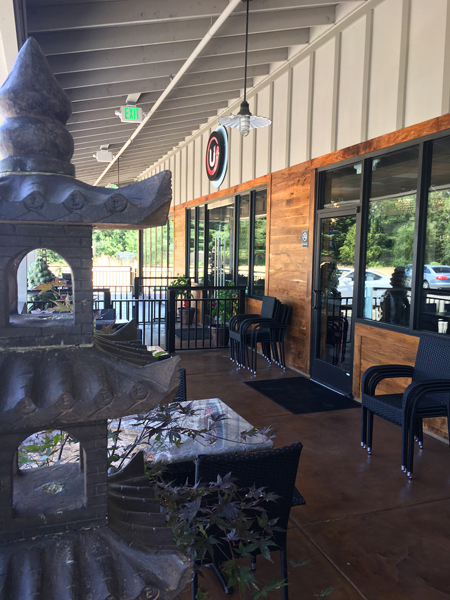 I had also been to High-Hand Nursery a handful of times and knew the food was delicious. The plan was to grab brunch first at the High-Hand Cafe in Loomis and then drive on over to Maple Rock Gardens in Penryn. I then kept reading… Come walk with the bees, um… did I mention that I tend to run and scream like a little girl if a bee lands anywhere near me? O.k. – I can do this. I can be “one with the bees.” Wear light clothing, no floral patterns, avoid fragrances, walk calmly, don’t flop around swinging your arms like a crazy person (that’s my interpretation of don’t wave your hands) – I’ve got this. No really… I can do this. I look in my closet and my first thought is – holy crap, I have a lot of floral tops. My second thought was – I sure have tons of dark stuff – black, gray and navy clothing… last thought – probably not a good idea to wear my bright yellow/ retro New Balance shoes. People, the pressure was real. I decided on jeans, a light blue t-shirt and a mint green cardigan and I was still scared that bees would think I was a lavender bush. So I went camping with my aunt, uncle, cousin and brother when I was around 6 years old. It was my first time. We were eating lunch and I got stung in the corner of my eye by a bee. My face and lips swelled up crazy fast, but I could still breathe o.k., thank God. The nearest Mom and Pop medical facility was close to an hour away. I eventually got treated with a shot and ice and by evening I was back at the camp site. From that day on – I’ve been deathly afraid of bees. I managed to not get stung again until my early 30’s, while cleaning the tile in my pool. The bee got me right under my arm. I ran into the house and popped two Benadryl and waited to see if any swelling would happen. Nope, I was in the clear. I either outgrew my allergy, or maybe it was due to actual bee sting juice in my eye, resulting in a faster delivery method to my system. We arrived at High Hand just before 9 a.m. to get our breakfast on. I went with the Huevos Rancheros and was not disappointed with my decision. 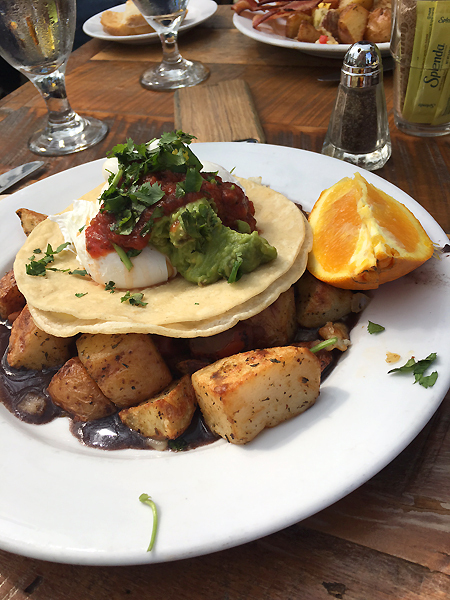 The poached egg on top of the crispy tortilla was my favorite part. I originally ordered a wood-fired pizza, what? – it was ON THE MENU… but apparently they don’t fire up the pizza oven until 10 a.m.
After a nice/hearty breakfast, we did a little shopping at the nursery and then headed over to Maple Rock Gardens. 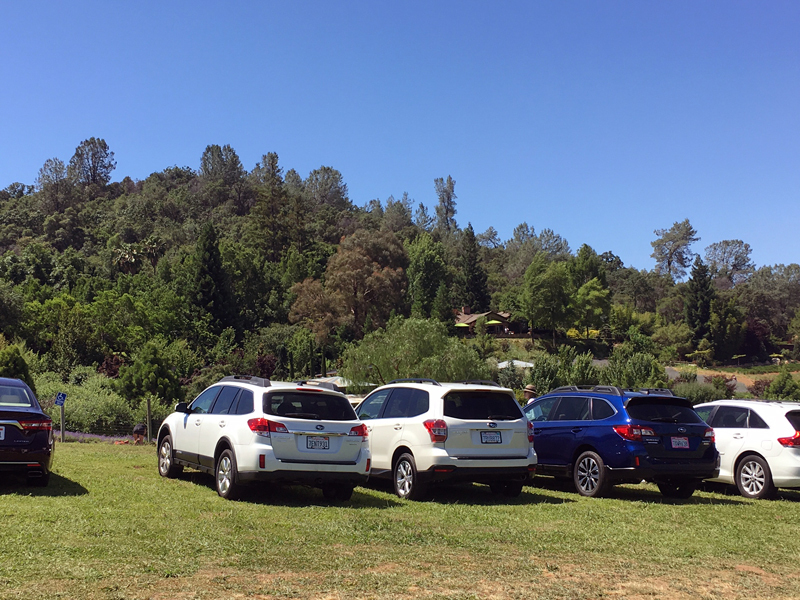 We parked and made our way to the entrance. Carolyn came prepared. She brought buckets, shears, a basket for my blog photos, (Love that girl) chairs for all three of us, and a few umbrellas. We were set. The weather was perfect and the views were equally beautiful. 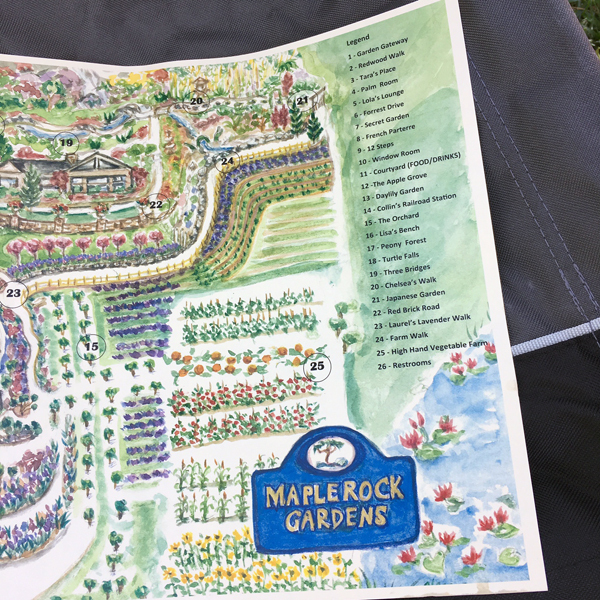 We grabbed our map and headed towards the rows of purple. I had Benadryl in my pocket just in case. I’m happy to report that no “Ouch Ice” was needed for our group. 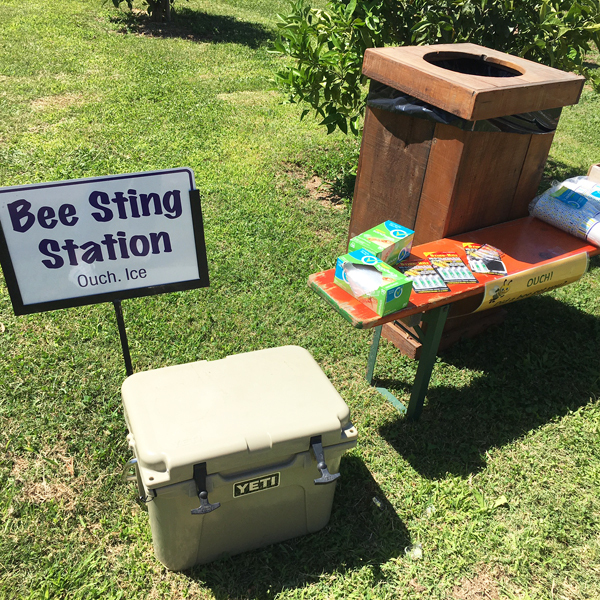 It was cool, they were prepared for guests with Sting-Kill packets, ice, water, shears and plastic bags – in case you wanted to just cut off your limb after getting stung. 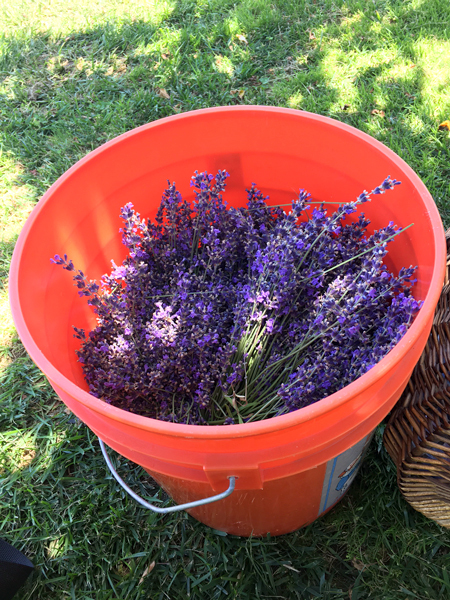 Ha-ha… they were actually provided to store your lavender clippings in the event that you hadn’t reached pro status with buckets or baskets like us – again, thank you Carolyn. 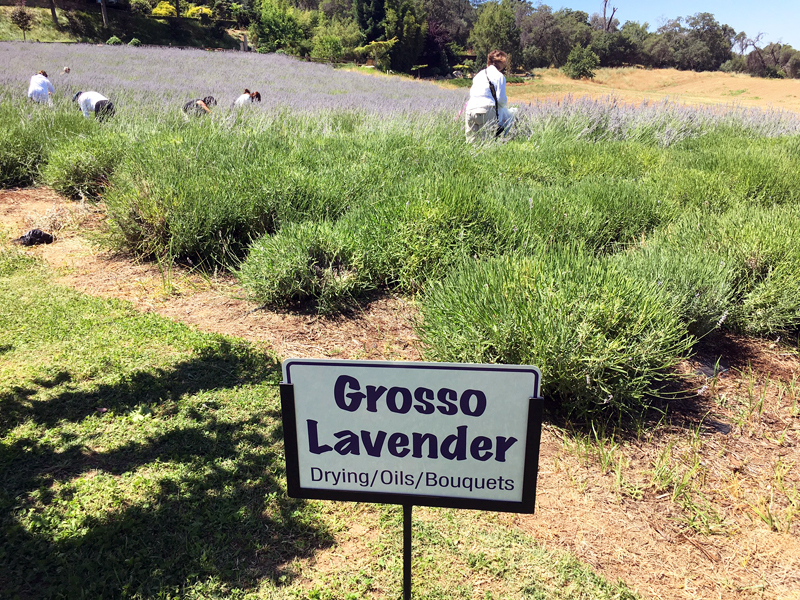 We went for the Grosso Lavender first… saving the best for last. You can see that the first 5-10 bushes in each row had already been clipped. We had to venture deep into the rows… which meant deeper into the worker bees. 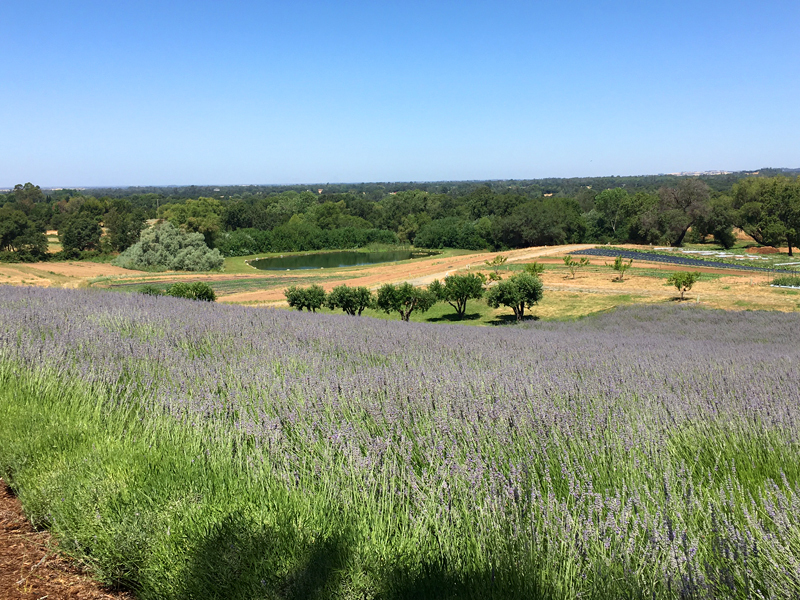 As we got farther down the rows of uncultivated lavender, the buzzing increased. It was a constant low hum. The rapid wing beats of bees create wind vibrations making a buzzing sound and some bees are capable of vibrating their wing muscles and bodies while visiting flowers. These vibrations shake the pollen off the flowers and onto the bee’s body. Some of that pollen then gets placed on the next flower the bee visits, resulting in pollination – and that is your science lesson for the day. 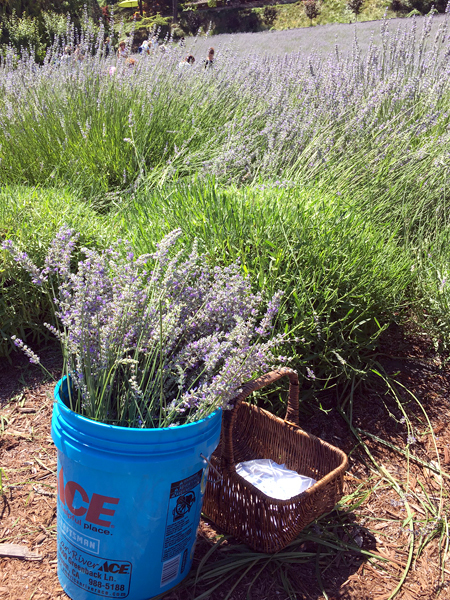 We filled our bucket and then walked around the grounds a bit with the scent of lavender following us the entire way. 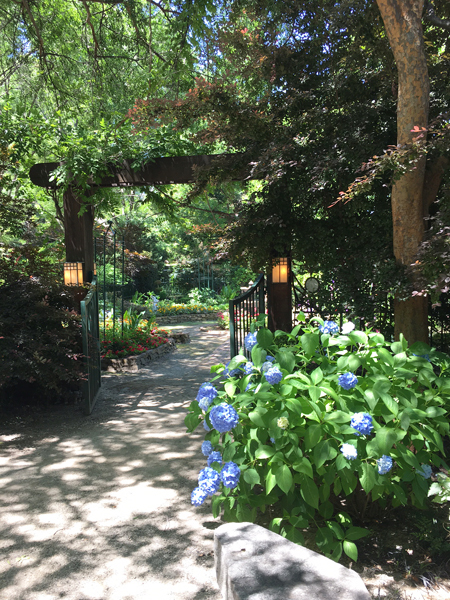 The entrance to the Alice and Wonderland Garden is one of my favorite spots at Maple Rock. Rabbit sculptures and over-sized metal flowers filled the garden beds. The hydrangeas in other areas of the gardens were beautiful too. It was so relaxing to just stroll through at our leisure. We took a break to relax under some crab apple trees and then we started on the Hidcote Lavender. I’ve cooked with lavender before and was excited at the prospect of having a bunch to try out different drink and food recipes. We got our second bucket filled thanks to Carolyn’s mad clipping skills. People actually thought she worked there. Yes, she is that awesome. We put Carolyn in charge of drying out the lavender. 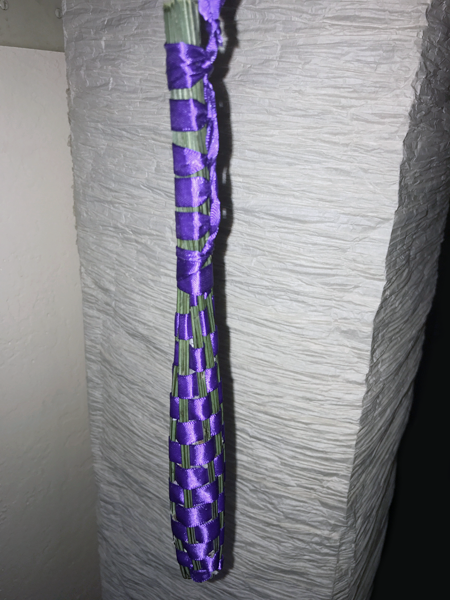 It was a solid choice… because later that evening she texted us a photo of her first attempt at making a lavender wand. Super impressive… love it and all the Pinterest pins she’s been sending. I’m all about making Chocolate Lavender Brownies because they were great the first time around, but I also see some wreath making in my future. 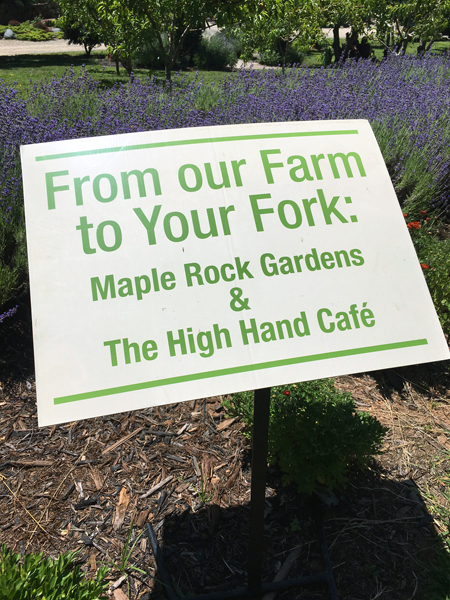 Maple Rock Gardens is hosting a second Lavender picking pop-up event this weekend (June 10 and 11). 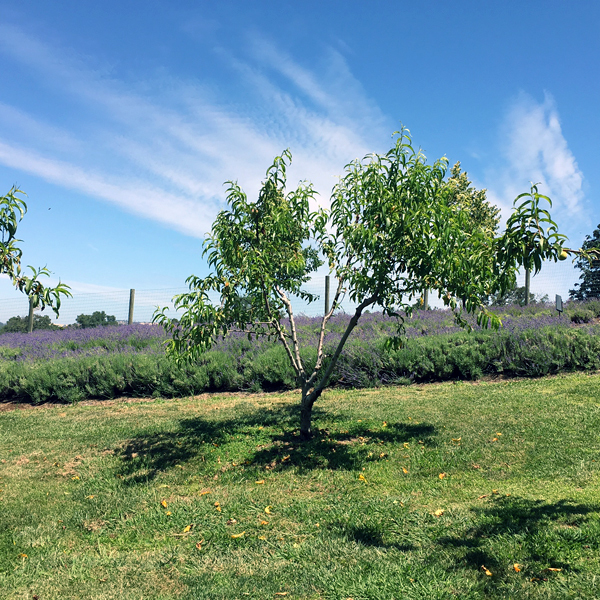 Tickets are $10 per person and you can pick lavender and enjoy the gardens from 9 a.m. – 2 p.m. Purchase tickets online or at the event entrance. There is a .50 added PayPal service charge if purchasing online. 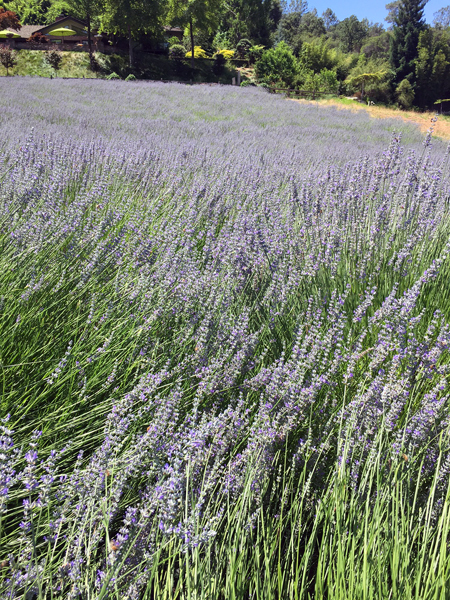 Please leave a comment below if you have any lavender recipes or crafty lavender projects to share with me and other readers. My friend Anna (hair stylist/salon owner extraordinaire) started posting on Facebook about a new restaurant in Elk Grove months ago. She also mentioned that her sister and husband were partners in the restaurant. Like, like, like – I followed their page and updates from Anna for months and I knew it was going to be awesome. Anna shared that friends and family were invited to a soft opening before the grand opening on May 31, so they could work out the kinks. 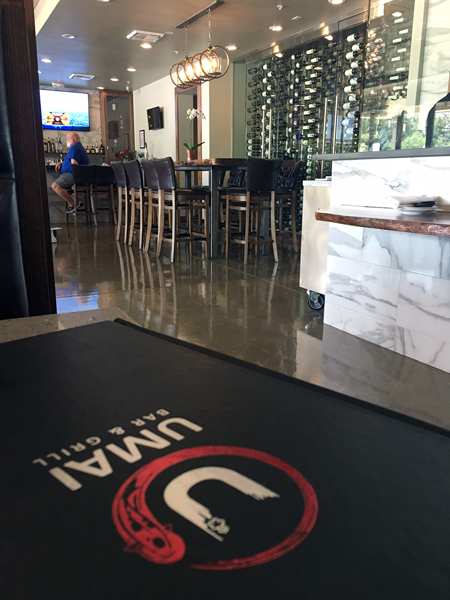 There were no kinks to be worked out – the food, service and decor was on point. Kristen was already planning on going to the grand opening, so convincing her to try it out early was easy. We jumped in the car and headed out for lunch. Foo dogs (guardian lions) flank the entrance. 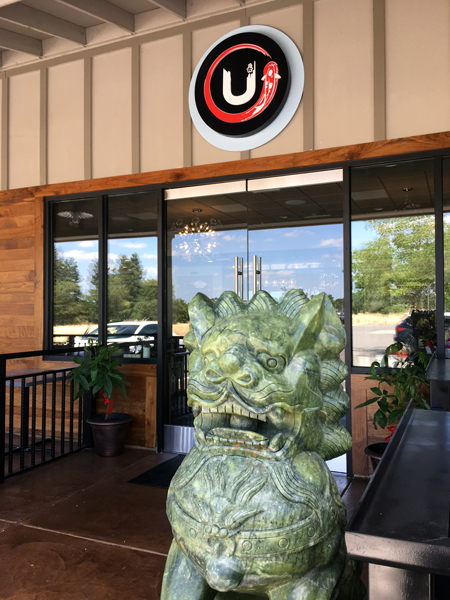 Foo dogs placed inside or outside a building are meant to protect your home or workplace from negative energy. It is said these guardian lions will stop anyone with malicious intensions from entering. The metal logo behind the hostess station was a really cool feature. They had already received lots of beautiful floral arrangements from well wishers. 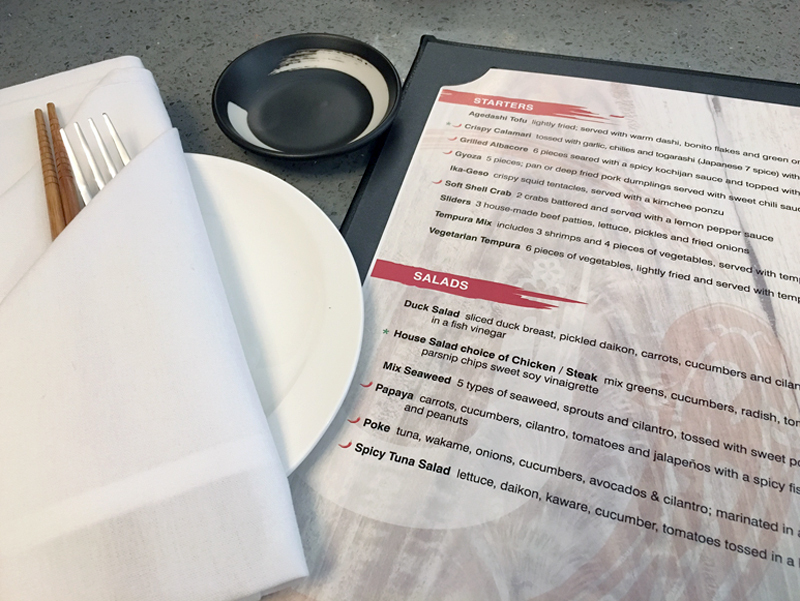 The graphic designer in me really liked the logo and structure of the menu. Leather cover, thick pages… it’s the little details that make a big difference. Andy (Anna’s brother-in-law and one of the restaurant founders) came over to the table to say, “hi”. Kristen knows him from his other restaurants in Elk Grove. 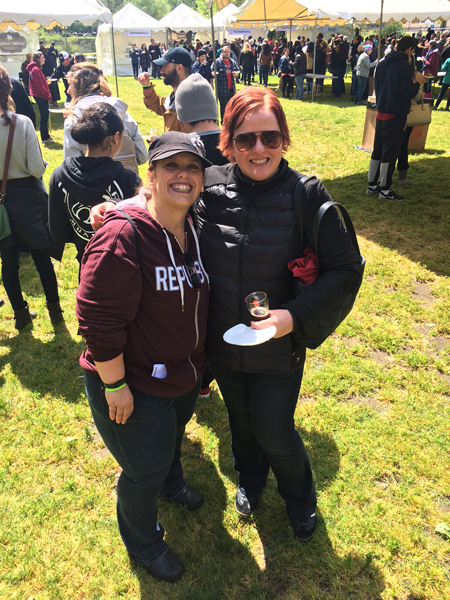 I would say – small world, but not really… Kristen knows everyone in Elk Grove, ha-ha – it’s true. 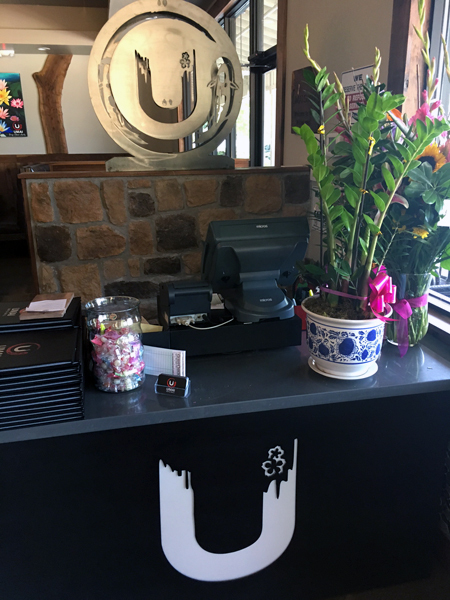 I later looked on the Umai website to read the “About Us” page to see how the restaurant came about. 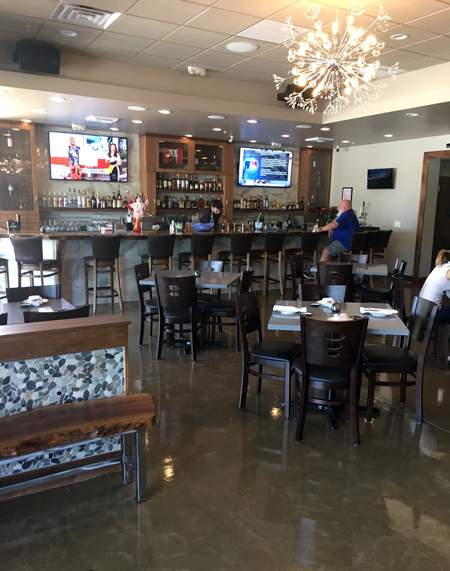 Elk Grove is growing and it’s nice to be able to support local independent restaurants. The city is full of chain restaurant options, but there are some true local gems and I have no doubt this will become one of those. The raw edged table in front of the temperature controlled wine wall was my favorite part of the decor. I also had my eye on the light fixture hanging above. I’m still on the search for a new dining room fixture and I’m drawn to metal, wood and Edison bulbs. We were seated on the backside of the booths, so natural light for iPhone food photos was at a minimum… the below shots do not do the food justice, you will have to trust me that each dish was more vibrant/beautiful in person. We ordered the Ika-Geso as a starter. 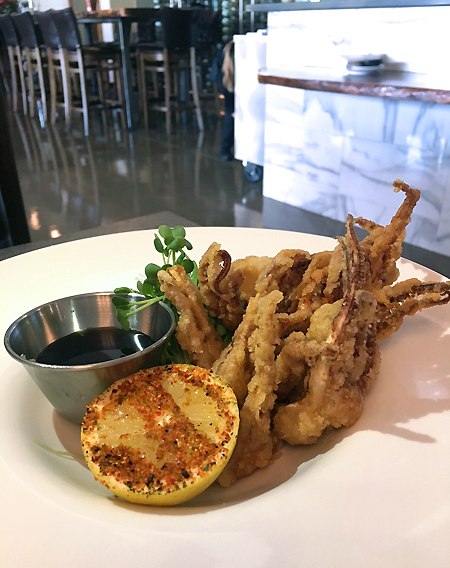 Crispy squid tentacles served with a kimchee ponzu sauce. Putting seasoning on the lemon was genius… stealing that idea for sure. I can’t wait to try the Crispy Calamari next time. Calamari is a favorite of Dan’s and something we often share while dining out. The Poke Salad came in a bowl, but my photo was too dark, so I opted to share the portion I plated. I would like this salad to appear on my doorstop every day from here on out. We’ve been experiencing some warmer weather and this would be perfect for those days. 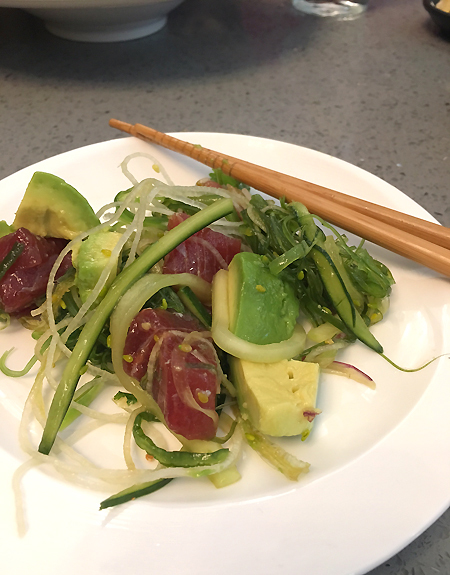 The Poke Salad ingredients consist of tuna, wakame (edible seaweed), onions, cucumbers, avocados and cilantro marinated in a spicy ponzu sauce. I was tasked with picking a roll. 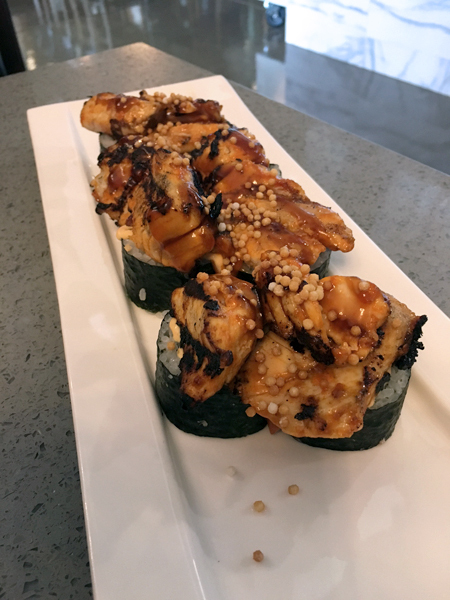 I went with the Albacore Galore – avocado, crab mix and tempura shrimp topped w/grilled albacore, arare (rice cracker), spicy cream and teriyaki. We pretty much stared at each other after our first bite and kept saying OMG, OMG, OMG… Yes, the grilled tuna was that good. 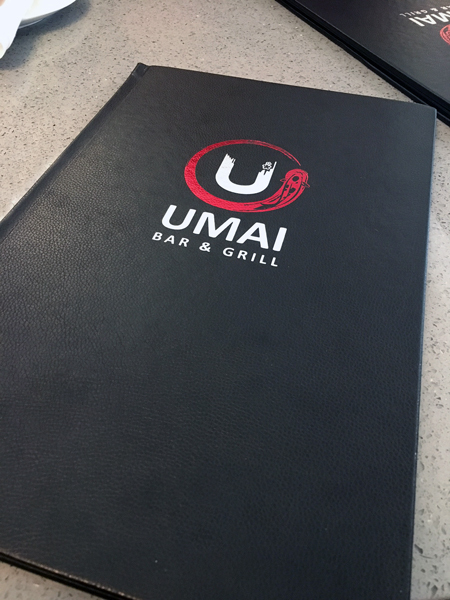 Umai has an extensive drink menu and I’m sure the bar area will be packed post grand opening. 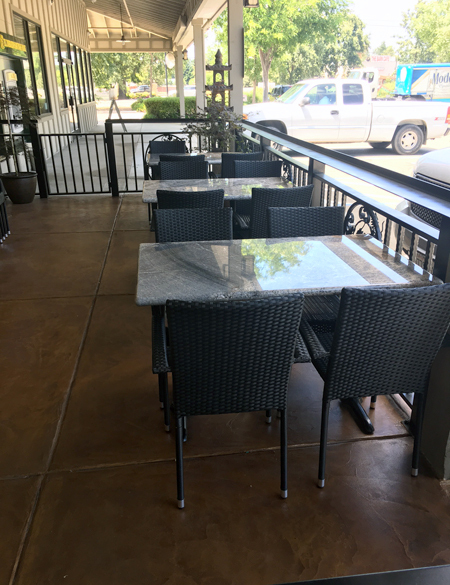 Our server mentioned that they are still working on their website and social media presence on Instagram. I’m looking forward to future posts that share their creations. We did not want to go back to the office after our overindulgent lunch. Naps sounded much better. I did bring home two to-go containers and have already made my way into those for dinner. 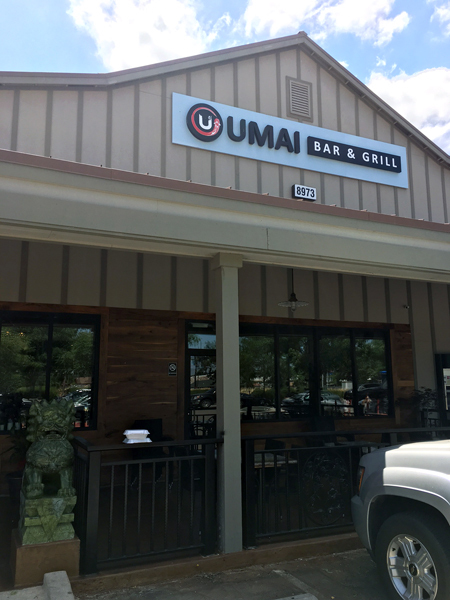 I see many more visits to Umai in my future. Who wants to check it out? 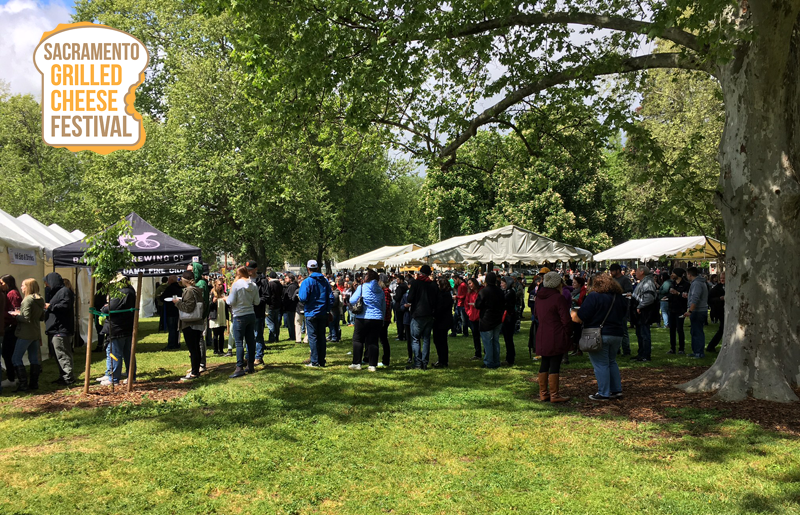 I started seeing friends on Facebook “Interested” in The Sacramento Grilled Cheese Festival almost a year before the actual event – which was held on April 8-9 in Southside Park off 6th Street in Sacramento. Being a huge fan of the grilled cheese, I of course clicked on the Facebook event to learn more. 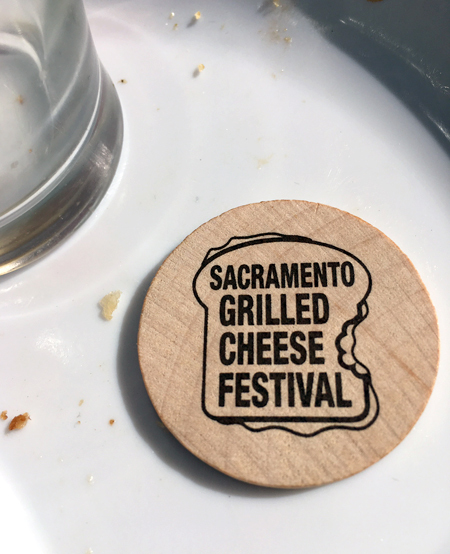 Enjoy cheesy deliciousness created by many of Sacramento’s great restaurants…A festival for grilled cheese lovers… why yes, that’s me! They had several ticket options, including a VIP option for the 8th that was for 21+ featuring specialty grilled cheese sandwich quarters paired with 4 oz. craft beer pours, hand selected to match. SO.MUCH.YES – Sign me up! I had talked about going with friends and never got around to purchasing tickets and then the price went up and there were less than 10 tickets left before selling out. Whoops… my girlfriend Kristen and I scored the last two tickets and ended up paying $50/ticket. The smart early birds got theirs for $35. Part of the ticket price went to support the Crohn’s & Colitis Foundation of America – a cause I was happy to support in honor of my late husband Ace. I managed to get a horrible cold the week leading up to the festival. I’m talking 2 bottles of Robitussin and three boxes of Kleenex kind of horrible, but I didn’t let that stop me from attending. It rained most of the morning and I was worried we’d be stuck running from tent to tent. I wore layers and ended up taking off both jackets by the end of the day. The weather Gods were on our side and the clouds parted enough to let the sun shine through. Kristen scored an amazing parking spot just outside the park. 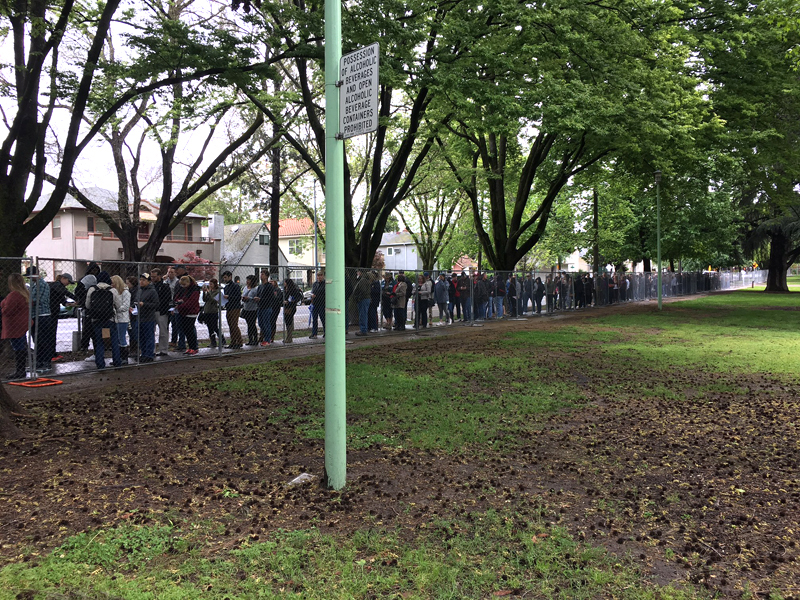 The line to get into the festival was already 100+ people deep and we even arrived early. They were checking IDs, scanning tickets and only letting in small groups at a time. We got the lovely added benefit of being harassed by an anti-dairy industry protester screaming at festival goers while we waited. Sigh. I’m all for people that choose to believe in something enough to speak their mind about it, but when you are an a-hole to people that just want to enjoy THEIR CHOICE, it really does defeat the purpose and diminish the message you are trying to spread. We were given food/drink tickets, a wooden token for voting for our favorite, a 4 oz. 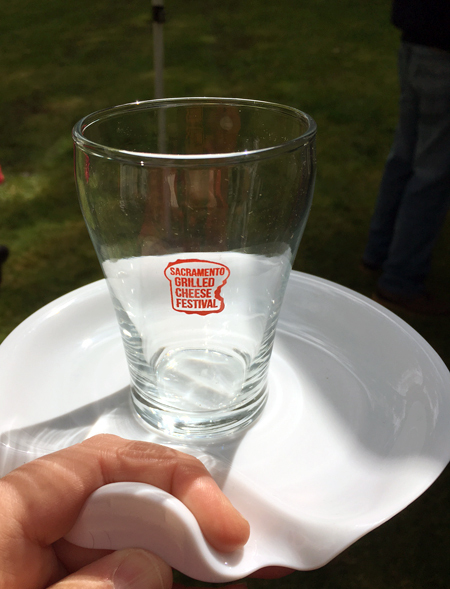 glass for beer and cider and a plastic plate upon entering. 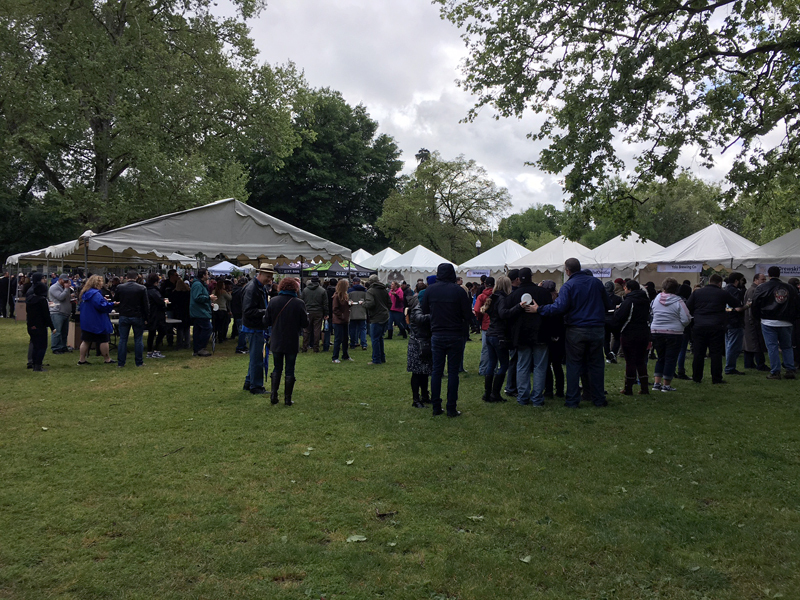 There were 10 booths to visit and Kristen suggested starting at the opposite end to the entrance – that turned out to be a great idea, especially since we got to start with a dessert grilled cheese and cider. 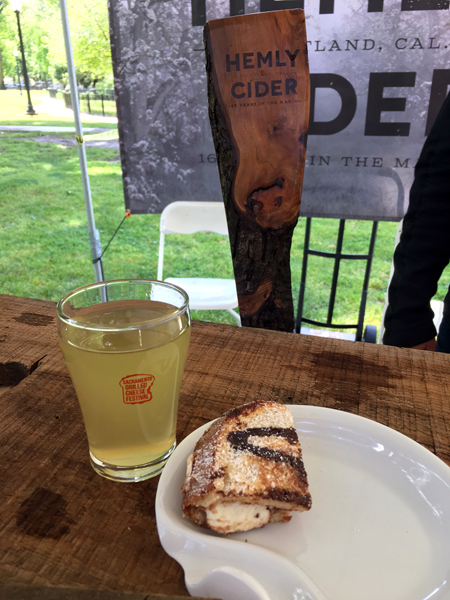 Land Park Sandwich created Mimi’s Sweet Tooth – Cream cheese and Nutella on sourdough drizzled in chocolate with powdered sugar, which paired amazingly well with Hemly Cider Co.’s local 5% estate grown pear cider. 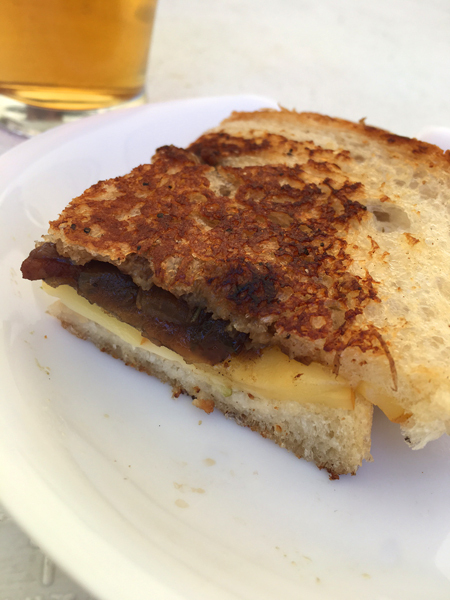 Next up was Hoppy Brewing Company which had a sourdough, brie, apple, onion combo with good flavor, but it was a little dry and the cheese wasn’t melted enough. 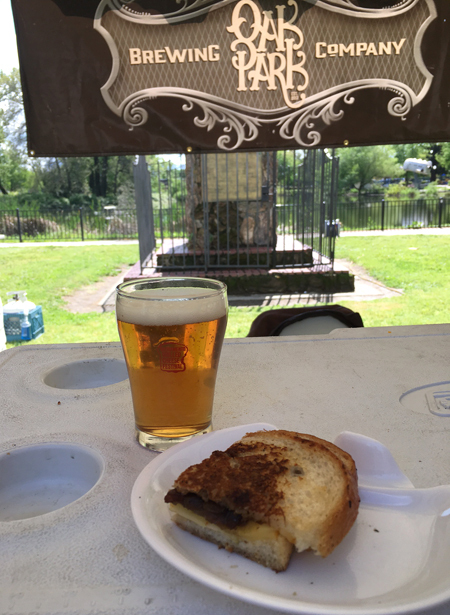 Ink’s Triple Grilled Cheese – Cheddar, pepper jack and American cheese and bacon on parmesan bread was paired with Three Mile Brewing Co.’s Honey Blonde Ale. I enjoyed it and really appreciated the gooey cheese and bacon combo. The Rind and Bike Dog Brewing Co. was up next. 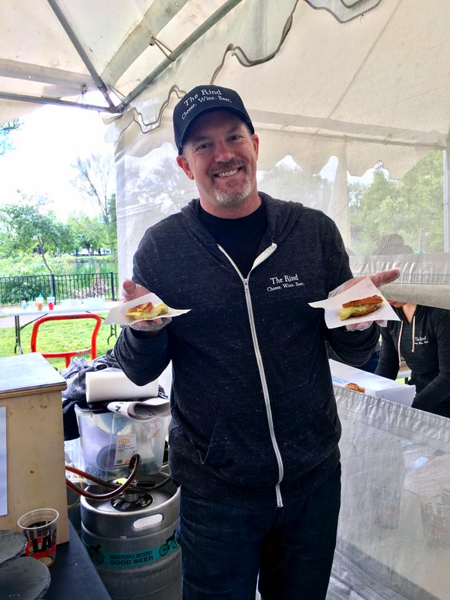 The Donut Grilled Cheese – Exsqueeze me? Did they say Donut Grilled Cheese? Why yes, yes they did. 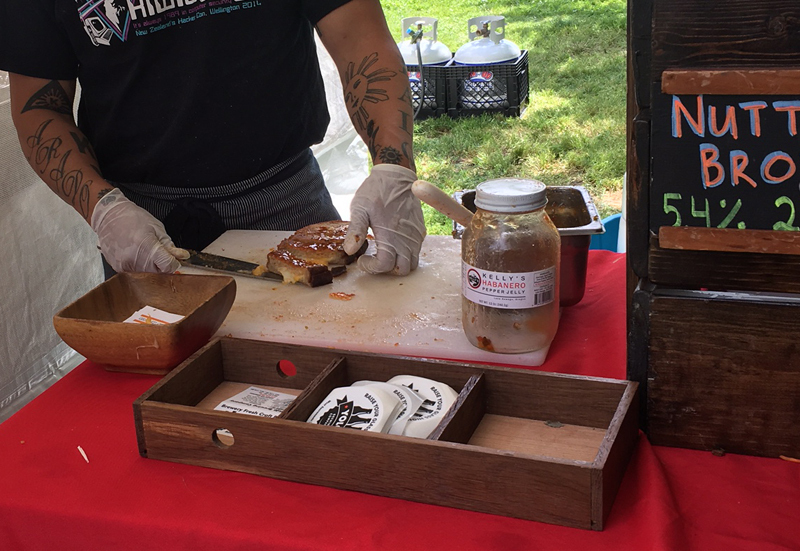 The Rind featured Marie’s Donuts – a raised-glazed donut turned INSIDE OUT and then grilled with Point Reyes Toma Cheese, a jalapeno-parsnip spread and Fuji apple slices… paired with Bike Dog Brewing Co.’s Milk Stout Beer. OMG – this was a freakin’ amazing pairing and got me super excited for the day and all of the others left to try. Pushkin’s Bakery and 2 Towns Cider was our next booth. Pushkin’s Bakery featured their Vegan Adult Grilled Cheese Sandwich – which I blogged about in my Brunch at Pushkin’s Restaurant post. Cashew pepper jack cheese, tomato and arugula served on gluten free focaccia bread. Like I said in my post, I was so surprised by the flavor, I loved it! – wouldn’t classify it as “Grilled Cheese” but for sure an awesome cheese sandwich. 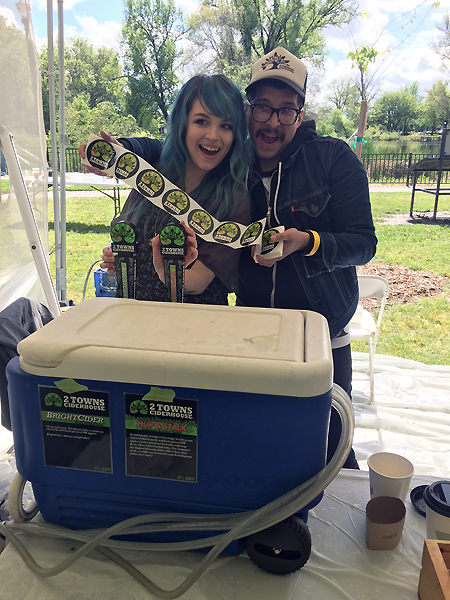 I chose to pair it will 2 Towns Ciderhouse Bright Cider (hard apple cider) and Kristen paired hers with their Hop & Stalk – Imperial Hopped Cider. We were both happy with our choices and they had stickers and really interacted with festival goers – thumbs up to that! Oak Park Brewing was up next – they had two choice pairings. I went with the smoked gouda, bacon jam and Granny Smith apples on sourdough paired with Steamphunk Saison and ZOMG – this was in my top 3. I loved it! Kristen went with the other pairing so we could taste both. Sharp cheddar, American cheese, parmesan cheese skirt, on sourdough topped with Cowgirl Creamery Mt. Tam Brie bechamel sauce paired with Citra IPA. Wow… so creamy and delicious – both pairings were top choices. 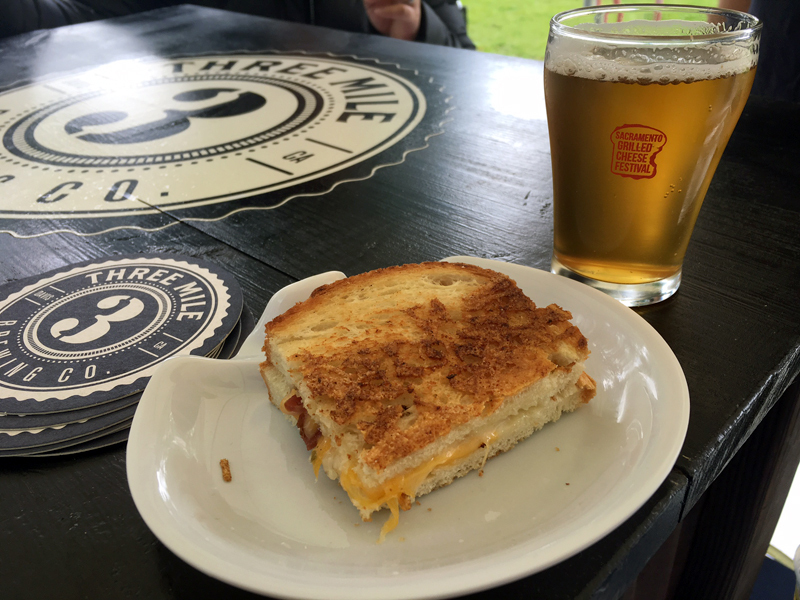 The GrilledCheezGuy & Yolo Brewing Company were up next. 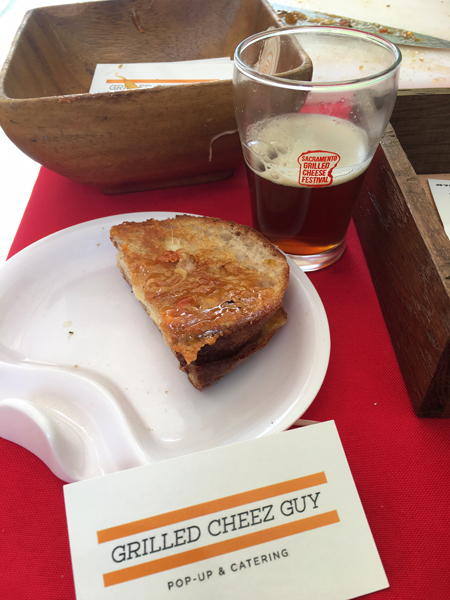 The GrilledCheezGuy is a catering, pop-up, and soon-to-be sandwich shop started at the Oakland Art Murmur in 2009. I am not absolutely sure what kinds of cheeses were used, I forgot to ask and there wasn’t any signage…thinking one had to have been Gruyere. 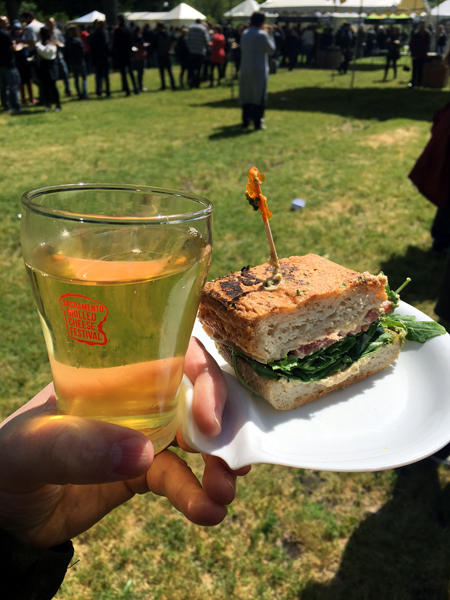 I was honestly too mind blown from the most amazing part of the sandwich – Kelly’s Habanero Pepper Jelly used on the OUTSIDE of the bread – this was also in my top 3 favorites and ended up getting my final token vote. 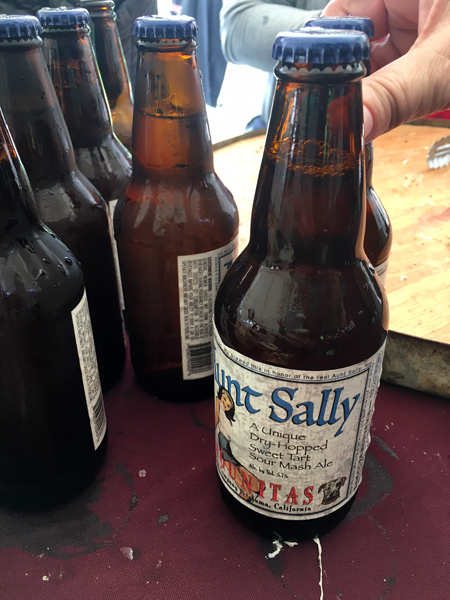 Teamed with Yolo Brewing Co.’s Nutty Brown Ale style beer… Yes and Yum. Drewski’s Hot Rod Kitchen and Track 7 were up next. We had already been waiting in line for 30 minutes when Drewski’s crew started counting from the front – they stopped with four people in front of us and said that they had run out and didn’t have any more pulled pork left. That was such a huge disappointment/bummer. They still served up a classic grilled cheese, but I would have loved to try the original pairing. Track 7’s Hoppy Palm – American Pale Ale was the pairing choice. 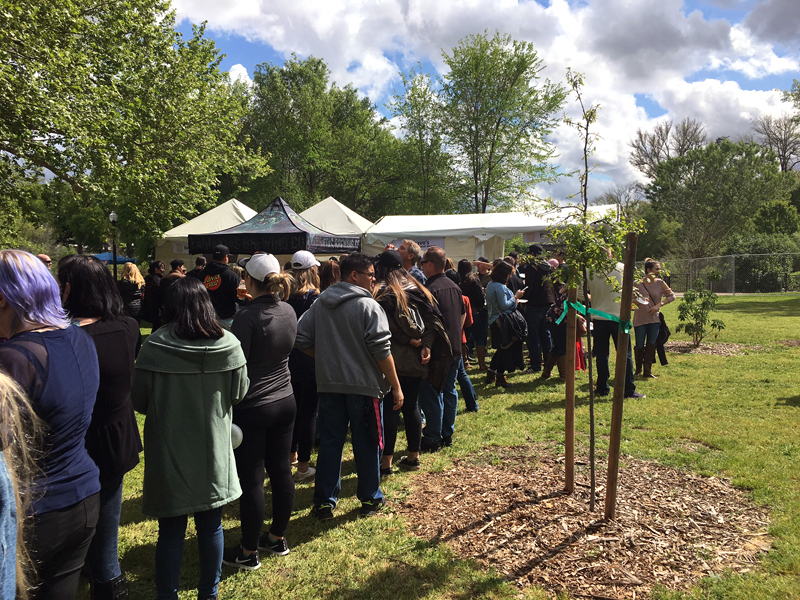 I waited in the Bravo’s Soup & Sandwich Shoppe/River City Brewing Co. line while Kristen waited over at the Sonoma Coast Shuckers and Lagunitas booth. It was the longest line of the day and Bravo’s was moving fast enough for us to switch places. It was GAME ON and we were winning! 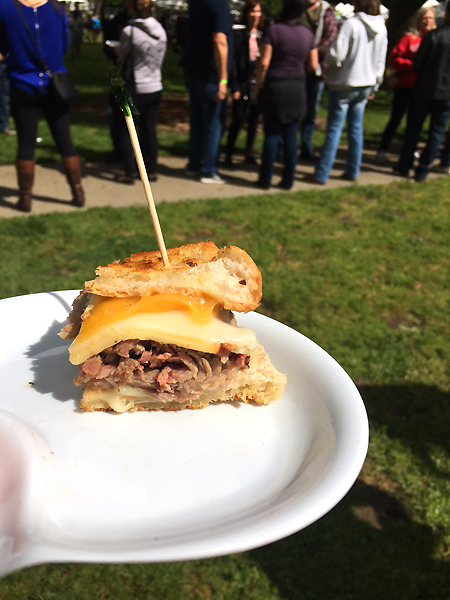 Bravo’s served up Santa Maria rubbed Tri-tip, smoked gouda, cheddar, provolone and pepper jack on a jalapeño crusted bun. Super “Team Moist” and the smoked flavor of the meat combined with the cheeses and jalapeño infused puff bun was incredible. 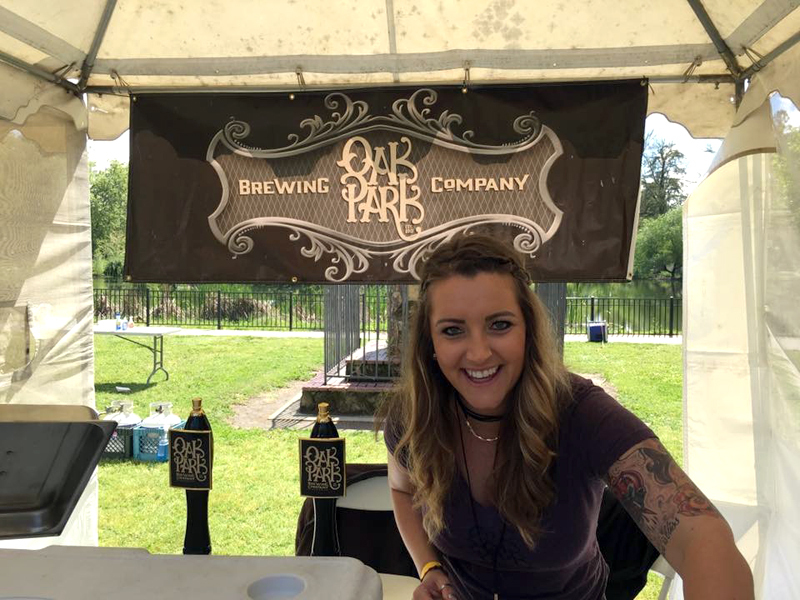 I found out later that Bravos and River City Brewing Company took the People’s Choice award. 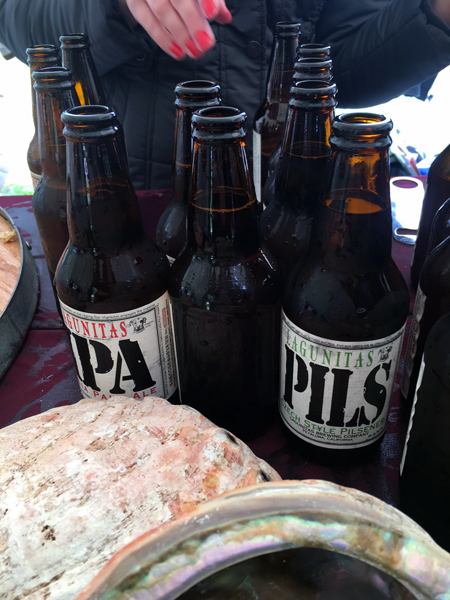 Sonoma Coast Shuckers and Lagunitas did not disappoint. 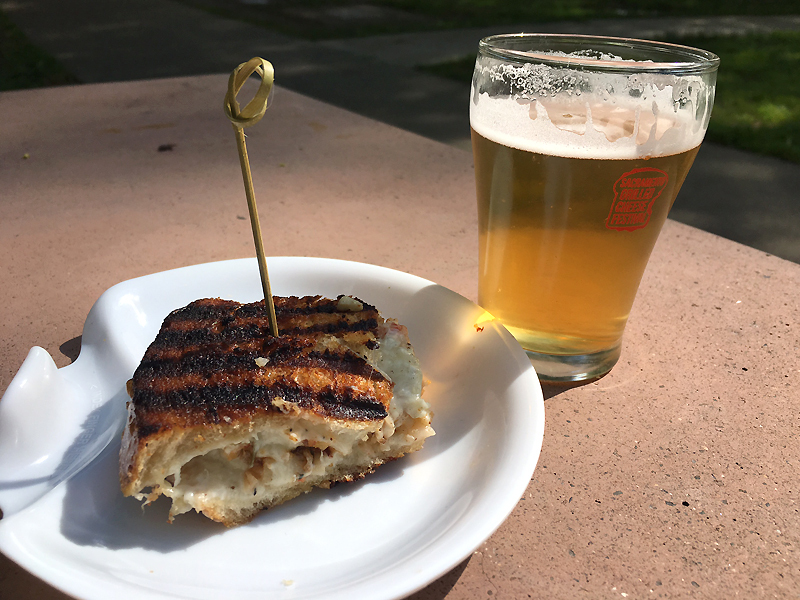 Sonoma Coast offered up two choices – Lobster Grilled Cheese paired with IPA or Rockefeller Grilled Cheese paired with Czech Style Pils or Aunt Sally Sour. One of the lobster beer pairing selections was crossed out, I think it was Davey Murray’s Best Scotch Ale, would have loved to try that one. We both chose the Lobster Grilled Cheese and I went with the Aunt Sally Sour and Kristen went with the IPA. 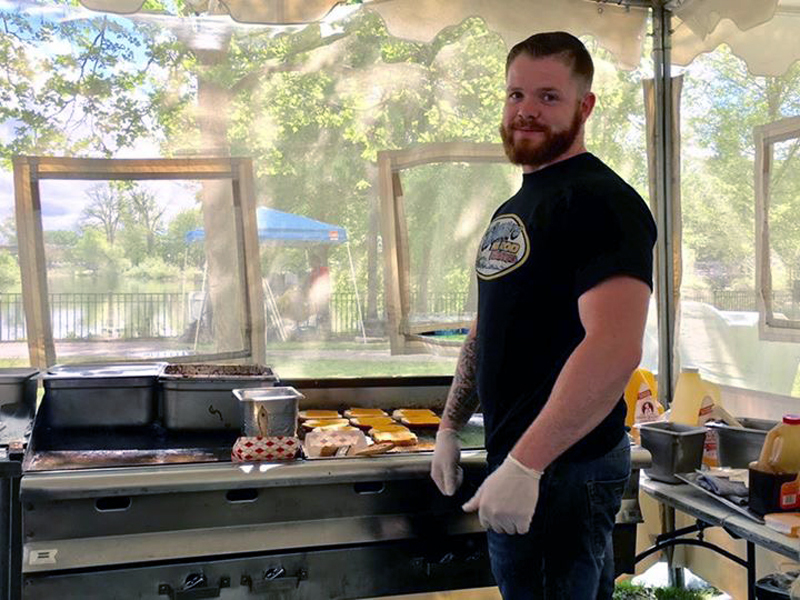 We recently chatted with the owner of The Rind at another event and he said that they learned a lot being that it was the first festival and they plan to change some things for next year. Lots of booths ran out of food on the first and second days. I guess we were lucky in that we only experienced it with the last two booths and I’ve had Drewski’s from their food truck many times, which included their pulled pork. All in all it was a lot of fun – trying to juggle the glasses and plates with jackets/purses, etc. 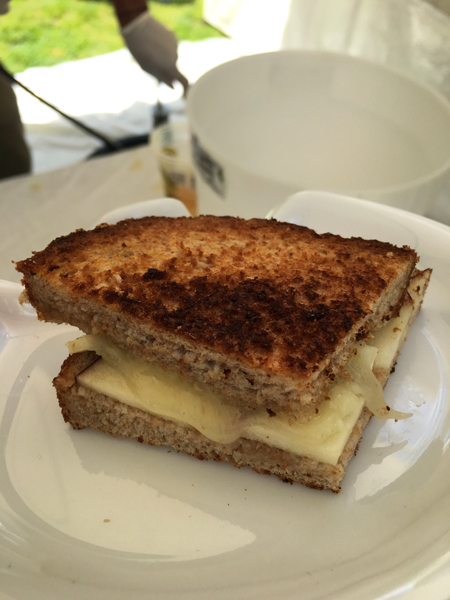 was a bit of a struggle, but man… grilled cheese at every stop sure made up for it. I told Kristen that I wasn’t going to finish each of the 4 oz. pours due to being sick and already jacked up on cough syrup… then after finishing the last drop of the 5th pour, I remembered saying that. Ha-ha. The fresh air, melting cheese, beer and cider magically made my cough disappear for a few hours and I welcomed it. I felt horrible the next day, but really enjoyed myself at the festival. I didn’t attend Sunday’s general admission – all age family part of the two-day festival, but that sold out too. The website has a newsletter link where you can sign up for alerts for the second annual. They claim they will be back and better for 2018 – woohoo!